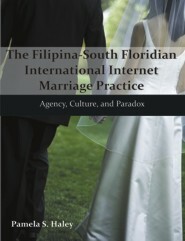 This dissertation concerns the structures and individual agency of Filipina brides who met their American husbands through Internet or pen pal advertisements. Popular media, legal scholars, and some feminists have largely described the phenomenon in terms of its oppressiveness toward the women involved, thus dismissing any agency on the part of the women. Similarly, much of the scholarship has located the American Internet grooms as ogres who are out to exploit these women for domestic and sexual services. If prominent researchers of this phenomenon are correct in their assessments that Filipina Internet brides operate as effective agents, then one also assumes these women continue that agency when they settle into their new lives as Filipina wives married to American men. Therefore, my central research question is: How has this agency manifested itself, and has this manifestation been problematic for the American groom, who, from the typical Internet ad's text and images and coupled with prevailing American cultural assumptions, assumed he was getting a submissive wife? To explore possible answers to these questions I performed a rhetorical analysis of two typical Internet advertisements. The focus on the ads is important to my study because the Internet advertisements both shape and reflect the popular view of the so-called Filipina “mail-order bride.” Next, in order to gain the Internet brides’ and grooms’ perspectives of the phenomenon, I interviewed three Filipina-Americano couples currently living in South Florida between November, 2005, and October, 2007.